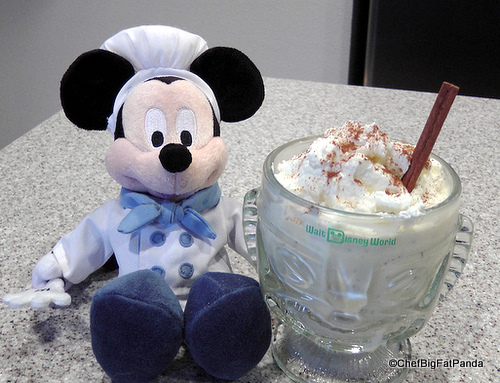 Today, Chef Big Fat Panda’s DIY Disney Recipes column brings us a sweet treat from Animal Kingdom Lodge’s Sanaa! Thanks to Chef Bob Getchell for sending along the recipe. Take it away, Panda! 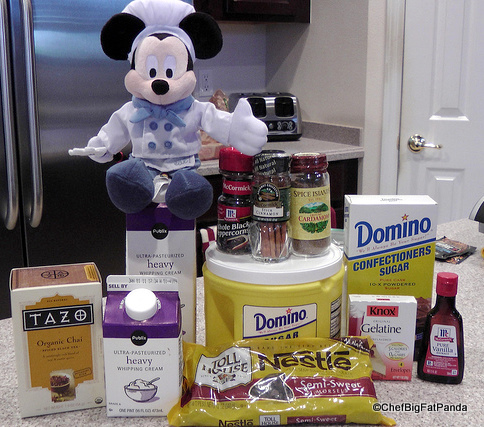 Hello Disney Foodies! Boy, do I have a treat for you! I want to be honest and tell you that I procrastinated about this recipe a bit. It is totally out of my comfort zone because I fell into the same trap that I warn against time after time. If you have ever read my articles, you know that I advise you not to “fear the ingredients” — that you can often make a recipe work with a substitution. Well, I feared the ingredients (you’ll see why). We then decided to approach this fantastic dessert from a different perspective. We thought — Let’s try to be as true to the recipe as possible, while finding alternatives that are readily available to most people. With that freedom, here it goes… and after the result, I am glad I stopped being scared of Sanaa’s Chai Cream! 1. 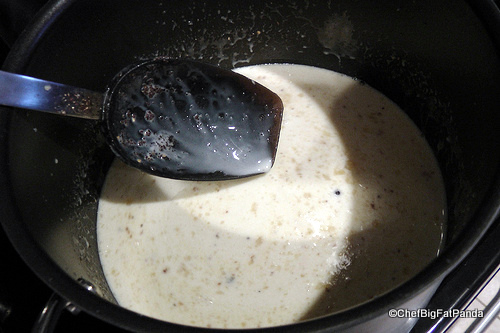 Combine 5 cups of cream, vanilla bean seeds, and granulated sugar in a medium saucepan over medium-high heat. Bring to a simmer, stirring occasionally. 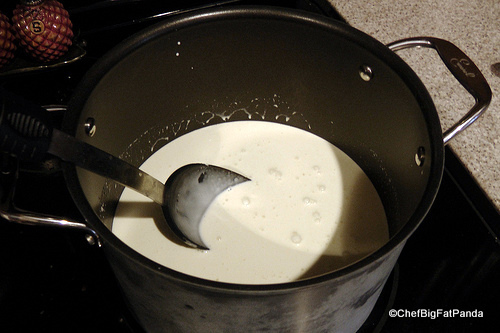 Chances are, your heavy cream is refrigerated, so it will take some time to warm this mixture up. Don’t rush it and burn the cream. Just stir often and let it heat up slowly. 2. 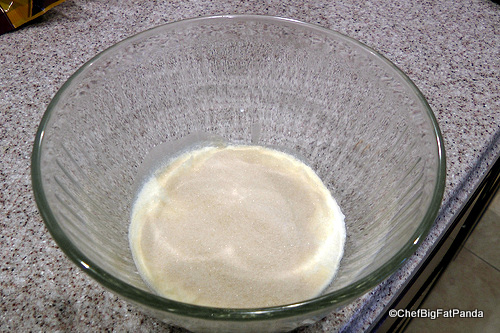 Place 1/3 cup cream in a small bowl, and add powdered gelatin; stir to mix. This should become almost doughy like once it mixes. This will later be incorporated into our heated cream that should begin to simmer shortly. 3. 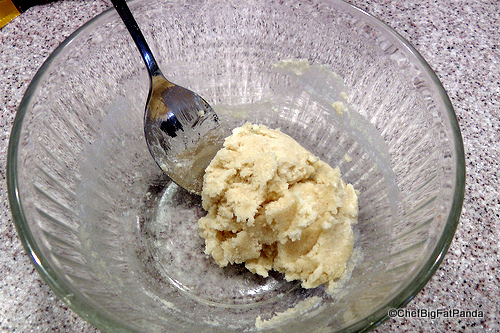 When the cream-sugar mixture simmers, immediately remove from heat, and add cream-gelatin mixture, stirring well until gelatin is completely dissolved. Add tea, cinnamon, cardamom pods, and peppercorns. It took quite some time for my gelatin mixture to completely dissolve, so keep stirring. 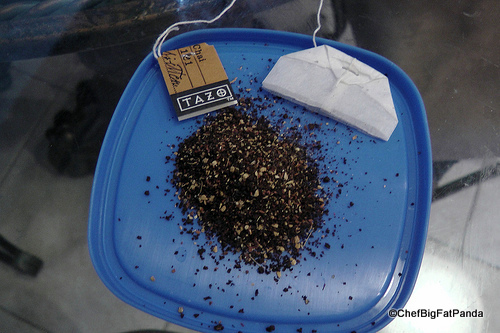 Rather than grinding up some black tea, I was able to find some nice black chai teabags. I cut one open and used the ground tea. 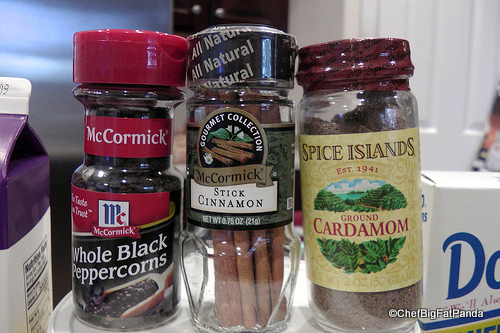 I added in my cinnamon stick, peppercorns and Cardamom powder. Wow, this smells simply fabulous and very relevant during the Holidays! 4. Let mixture steep for 10 minutes, stirring occasionally. 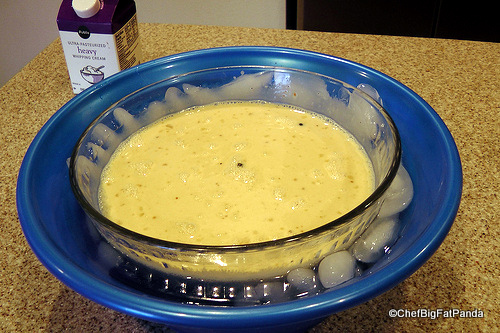 Pour mixture into a metal bowl set in a larger bowl of ice water. Cover with plastic wrap, and let steep and cool for 30 minutes. I did not have a metal bowl handy and I wasn’t about to steal one away from my neighbors dog, so I improvised yet again. I used a thick glass bowl to set into a larger plastic bowl of ice water. It worked just fine. While we are on the topic of improvising, I didn’t have plastic wrap either (boot to the head) and used aluminum foil. Again, worked just fine – whew! The edges of the mixture were starting to thicken and set right as the 30 minute mark came around. 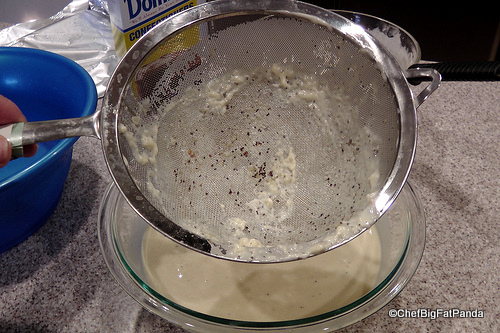 Using the sieve, I poured the mixture (pushing through some thick areas) into another clean glass bowl. I then set it into the freezer for 20 minutes as instructed. 6. Divide mixture evenly among 8 (5-ounce) glasses or ramekins, and refrigerate for at least 4 hours before serving. 7. Before serving, combine remaining 1/2 cup cream and powdered sugar in a large bowl. 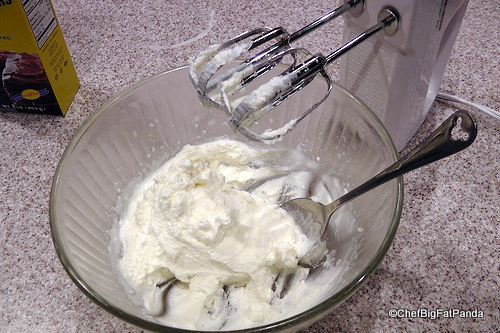 Whip with an electric mixer until stiff peaks form. 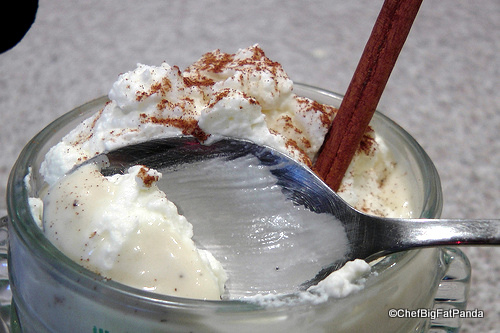 Dollop whipped cream onto each glass, then sprinkle with semisweet chocolate shavings. Serve immediately. Step 7 is a whole separate recipe on making fresh Whipped Cream. It is so simple and tasty that once you do it, you will NEVER use Redi-Whip or prepared Whip Cream again. I kid you not. Try it. So, let me sum this up. This recipe, even with substitutions, is very expensive. It is also a lot of work. BUT – it is so worth it. Let me state that I am not a custard or flan type fan. I usually dislike desserts of this genre. I would choose a cookie over this type of dessert any day, and I was very surprised with how delicious it was. It was cool and almost ice cream like. The Chai flavor made it feel sophisticated, yet comforting. I was pleasantly surprised. I was in such a rush to eat some of it, I completely forgot to put in the chocolate chips. I did sprinkle it with some cinnamon and include the stick. This is something I would make for a special event or special gatherings of friends and family. Please let me know what you think of this recipe; I really hope you try it out for the holidays. Your guests will thank you for something totally unique and satisfying. Dana – your right! I have to tell you, the result was soooo yummy. It won’t take you all day, I promise – try it! Looks awesome, and I love your glass; I want one! At what step would have put in the chocolate chips if you had remembered? I’m thinking this would be a fun dessert to try! Alex – You can buy those “Huba Huba” glasses at the Bou-Tiki store in the Polynesian, except they don’t have the logo on them last I recall (I know the ones we’ve got don’t). 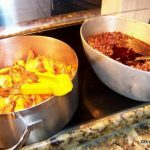 Chef – The recipe looks fantastic! I’ll have to try this one over the Christmas holiday! Great name for your tiki gods – I just name all my tikis “Tiki Bob”! Wow that looks great! Nice job. I love your improvisational skills and how you substituted for different items. I don’t think it would make much of a difference either in the case such as the Plastic Wrap. My guess is that it just needs some sort of a cover. Also, does it have to be Chai Black Tea or could something different be used? Not only do I fear the ingredients, but I fear any recipe that has more than two or three steps – and two of them have to be “boil water”. Can you just come live with me until I get tired eating? Anna – please send photos of my proposed room. Do you accept cats? Enjoy pasta? 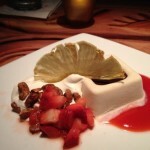 I LOVED this dessert at Sanaa so I asked for the recipe and was also a little overwhelmed by it. I may try it at home when I have some time. It is so good! But I will miss the chocolate spoon that it is served with at Sanaa. I know I have seen edible chocolate spoons for sale and I bet we can make them with a mold? Maybe a side note to a future recipe. 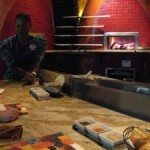 Chef – Great kudos to you and thanks for tackling a complicated and time consuming recipe. I myself, am not afraid to tackle something difficult, but in this case I believe I would have grabbed a Dove Bar and called it a day. But that is why you are the Chef. Alan – I really did LOL on that – thank you! This recipe looks delicious! Any suggestions for a vegetarian substitute for gelatin? In keeping it real – I didn’t know gelatin was non-vegetarian – then again, thinking back now I remember gelatin might have some pork fat origins, huh? Let me check it out. Stephanie – Oh boy! – here is what I found. Pectin and/or Agar Agar made from seaweed are the usual gelatin substitutes as gelatin IS made from pigs feet, hide and other various animal parts. If you look at what Jell-O is made of or all gelatins you likely would NEVER eat it again. BUT get this – Pectin will likely cut through the cream like an acid and Agar Agar only dissolves in boiling water which would not work with our recipe. I then found out that Jell-O makes a vegetarian version of their product but only flavored. My only half baked suggestion right now is to use 1 ounce of the Jell-O brand flavored gelatin and pick a flavor that might go well – vanilla perhaps if such a thing exists. I don’t think 1 ounce will cancel the delicious Chai flavor but I would love to know if you try it. 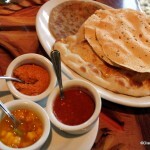 I asked for this recipe last time I was at Sanaa and is close to the original. I have also made it using fat free half and half to fit it in my Weight Watchers diet. Good but once you have had the real thing, its hard to go back. LOL I found the cardamom pods at Williams Sanoma, never substituted. This really is a taste treat and worth the trouble for that special dessert. Thanks for the info, Joanne! I have been wanting to make this for quite some time, and finally went to the store to pickup the ingredients. True, this dish is not cheap to make, and there is a slight adjustment that should probably be made to the above recipe to make sure that someone else doesn’t make the same costly mistake I did. In the above recipe, it calls for 1 1oz envelope powdered gelatin. 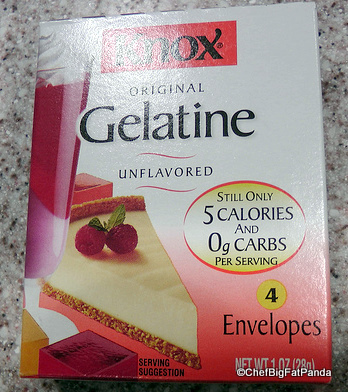 Shouldn’t this be 1 – 1/4 oz envelope of powdered gelatin? The entire box is 4 envelopes that equal 1 oz total in weight. I followed the directions above and had a bowl full of Chai stress ball. I would definately not use 1 oz. of gelatin as stated. The flavor was great, but the consistancy was so bad that we couldn’t even eat it. Just wanted to pass this along……. Hi Chef Ron — The recipe I received directly from the Sanaa chef does list a 1oz packet of gelatin. Perhaps there’s a typo on the original recipe? I’ll wait to hear what Chef BigFatPanda has to say about his experience. If you read my past recipes, you will know I am usually very vocal when I disagree with something in a recipe. That being said, I DID notice exactly what you are saying. I kept checking the amount of gelatin because I felt it was too much. I didn’t have a disaster or catastrophe as you can see and I did use all 4 packets as the recipe stated 1oz. I kept thinking I did something wrong or that the box of gelatin was wrong. I felt it was setting up too quickly. I thought it must have been me and didn’t want to argue with the Disney Gods because I was not sure. Now, after reading your note, I agree it likely should be half or 1/4 of the amount suggested. I think you are right AJ. I’m guessing it is a typo. Even if I would have let it firm up slower, the amount of the gelatin was still the same. So, the good part about this recipe is that I can still try it again without having to spend a lot of money to try again. All of the spices are now purchased and the only thing I need to buy to try again is purchase the cream and the gelatin. I’ll report back to the both of you my findings. I’m the same way you are, chef. I have no problem calling shenanigans when a recipe just doesn’t seem right. The only difference between what you did to prepare the dish than I, is I did use the metal bowls as directed. They were much thinner than the glass bowls and that could be the reason mine was setting much faster. I will be trying this recipe again with the lesser amounts because it really is such a flavorful recipe until I reach the desired consistency. Thanks for sharing and I’ll keep ya posted…..
OK, great! Keep us updated Ron! Was at Sanaa earlier this month and had the Chai Cream dessert and loved it! I like to cook but never make desserts so figured this would be a good one to start with. Thank you very much for the recipe and will start getting the ingredients to make it. fyi – the Chinese in the South steam milk with ginger and I guess there is pectin or something similar in the ginger that causes the dish to congeal into a hot lovely pudding but it is not served cold like this chai cream. When you say to add a cinnamon stick, do you just throw the stick in the pot or do you grind it up first? Same with the cardamom pods–whole or ground? I have all the proper ingredients, not sure what to do with them. 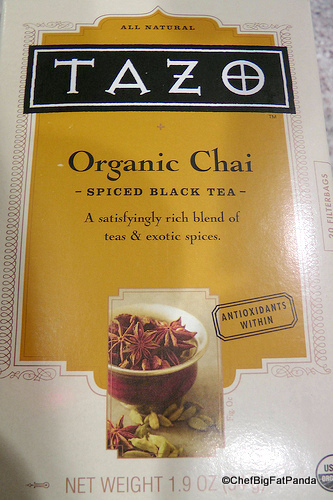 I also have my own home-made chai tea to use…I can’t wait to try this! When I first made this recipe I halved it, as it was just my fiance and I and I didn’t want a huge ton of it (assuming it wouldn’t keep.) For whatever silly reason, our gelatin packets here in Canuck-istan (Canada) are 15mls–about 1/2 oz instead of 1/4oz. I used a little more than half a packet (so between 1/4oz and 1/2 oz…maybe 3/8ths? eek.) for the HALVED recipe, as I figured this was still a bit less than a 1oz equivalent, and I didn’t really want to get into trying to measure out such tiny amounts as 1/8. Tonight I tried to make the full recipe, and this time, tried to stick to the 1/4 oz my using half a packet of gelatin–and they didn’t set at all! After doubling the freezer time, and hours in the fridge, we have a delicious but rather pointless chai cream soup. I’m now re-trying the recipe with a closer amount to what I originally used–so somewhere between 1/2oz and 3/4oz of gelatin, or a pack and a half. I don’t know if measurements or what conspired against me here, but what of the chai soup I have in my fridge now? Assuming it doesn’t set at all, can I safely reheat it and add more gelatin, or just bin the stuff? I can’t wait to try this! The good news is…this recipe can be EXTREMELY healthy. Get a good quality, pastured (meaning the cows eat the grass out at pasture, not corn and soy) cream (organic & pastured would be even better…then you know there are no hormones, antibiotics or GMO’s), a quality sugar (pure sugar cane…or maybe even do raw honey) AND a high quality grass-fed gelatin and you have a delicious and healthy dessert! There are two kinds of gelatin that are really good…Great Lakes and Bernard Jensen. You know when you make homemade chicken broth at home and you get that gel-like substance when it cools? That is gelatin that comes from getting all the nutrients out of the animal and is SO SO good for you. But, Knox isn’t quite gonna cut it in the health dept. Cinnamon is also very good for you! 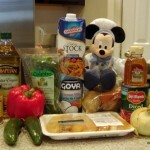 So, do it up with great ingredients and you really can eat delicious foods and be healthy!!! Yeah! Thanks again for the recipe!